France's new Socialist government slashed the country's economic growth forecasts on Tuesday, paving the way for a slew of cuts that are bound to anger many voters after President Francois Hollande promised to avoid austerity. By Daniel Flynn and Brian Love. After a grim assessment of public finances by the state auditor on Monday, Prime Minister Jean-Marc Ayrault acknowledged France’s economy was on track to grow by just 0.3 percent this year, less than half the 0.7 percent budgeted by the previous conservative government. For 2013, Ayrault said growth would be higher, at 1.2 percent, but still well below the previously slated forecast of 1.75 percent – leaving a substantial shortfall in tax revenues. An amended 2012 budget incorporating the Court of Auditor’s report is due to go before the Cabinet on Wednesday and would usher in numerous tax rises, while seeking to rein in budget spending without resorting to sweeping austerity, he said. With France’s triple-A credit rating already cut by Standard & Poor’s in January, other rating agencies are watching the new government closely to see that it is serious, despite its socialist ideals, about finding ways to hit its deficit targets. Blaming the sickly economy on former president Nicolas Sarkozy’s administration, Ayrault said the Socialists would tackle the problem by getting France’s economic motors running again rather than resorting to painful public spending cuts. “I am calling for a national effort. But I reject austerity. Nothing will be achieved if we do not have growth,” the prime minister said, adding the government would not renege on its promise not to cut public sector staffing levels. Spelling out policy plans for the coming five years, Ayrault confirmed campaign pledges by Hollande that more teachers and police would be hired, that 150,000 state-aided jobs would be created and that competitive industries would be promoted. To help industrial innovation, a public investment bank would be set up before the end of this year, he said. But with a bleak economic outlook and France facing pressure to rein in one of the highest public spending levels in Europe, the Socialists face a tricky balancing act. “President Hollande is going to have to be a political Houdini to pull this one off,” said Nicholas Spiro of Spiro Sovereign Strategy in London. 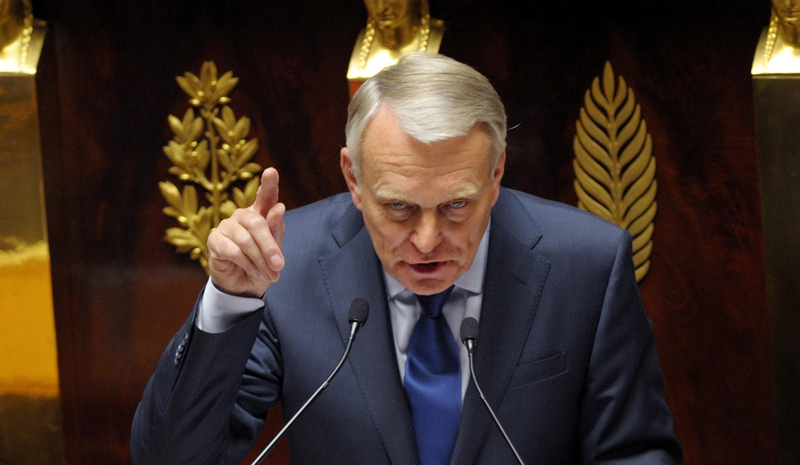 The revised 2012 budget will overturn a series of measures adopted by the previous government, including a reduction in wealth tax, a tax shield for high earners, and an increase in VAT to ease heavy social charges on salaries, Ayrault said. The Socialists will also push ahead with plans to separate banks’ retail and investment arms, to increase taxes on the financial and energy sectors and to slap a new 75 percent income tax band on those earning more than 1 million euros a year. The Court of Auditors said the government needed to find budget savings next year worth more than 33 billion euros ($41.5 billion) in order to reach a European Union budget deficit goal of 3 percent of gross domestic product. Next year’s adjustment – including an additional one-off charge of 5 billion euros to cover tax repayments to foreign investment funds mandated by a recent EU ruling – could total an unprecedented 4 percent of state spending. That comes on top of 6-10 billion euros in budget savings the Court of Auditors said was required this year for France to achieve a deficit of 4.4 percent of GDP. With its debt already due to exceed 90 percent of GDP in 2012, a level at which economists say it starts to sap economic growth, France risks being sucked deeper into Europe’s debt crisis unless it stuck to its targets, the auditor warned. After initially toying with rolling back France’s deficit targets, Hollande had decided to stick to them to avoid any risk of debt market contagion, insiders say. “In the short term, he will do it with tax hikes, but in the longer-term, Hollande realises that deeper structural reforms are required,” said Philippe Aghion, a Harvard professor who was an informal advisor to Hollande during the campaign. Hollande would target regional government, health insurance and pensions, he added. The government is preparing to present a plan to stimulate France’s shrinking industrial sector, which has bled 750,000 jobs over the last decade – it is due to be discussed with unions and employers at a social conference this month.